SAN FIDEL, N.M. (CNS) — National Catholic Schools Week has come and gone, but the work of forming students in a faithful Catholic environment is never finished for teachers, principals and school administrators across the country. The presence of Catholic schools is especially needed in some of the poorest areas of the country. By providing a quality education, the church helps young people in poor communities to realize their potential. This is exactly what principal Antonio Trujillo is accomplishing at St. Joseph Mission School in rural San Fidel in the Diocese of Gallup. Trujillo arrived at the school six years ago and saved it from the brink of closure. By integrating Catholic values into the students’ everyday education, Trujillo and his staff are creating a hopeful future for the largely Native American student body in an area of the country where hope can sometimes be hard to find. St. Joseph School was built in 1920 with the help of funds from Catholic Extension, the Chicago-based national Catholic fundraising organization that constructs churches and builds up the Catholic Church in America’s poorest places. Located between the Acoma and Laguna Pueblo reservations, St. Joseph’s student body is 90 percent Native American and 10 percent Hispanic, ranging from pre-K through eighth grade. Trujillo largely credits the school’s success to another collaboration with Catholic Extension. He participated in Catholic Extension’s Catholic School Leadership Initiative, a partnership with Loyola Marymount University in Los Angeles that seeks to develop promising Catholic school leaders in struggling dioceses. Funded by Catholic Extension, Trujillo and his classmates completed courses online and at Loyola Marymount to receive a graduate-level certificate in Catholic school administration. But the classes and certification were just a gateway to the real fruits of the program — meeting other Catholic school administrators in equally difficult situations and creating a network of support and fellowship. Trujillo said going through the program and engaging in this community gave him his mojo back, as he was beginning to feel burned out by the bleak situation of the struggling school and the endemic poverty of the area. By refocusing on the school’s true mission to be a beacon of hope and faith, Trujillo found the momentum to hire dedicated teachers and increase enrollment. Trujillo’s energetic positivity about the Catholic faith and the difference that faith can make is rubbing off on the students as well. The student body recently gathered for a Catholic Schools Week Mass in the school’s humble chapel, presided over by a visiting priest who drove many miles to be there. The priest is one of just 12 who serve the widespread Diocese of Gallup — the only U.S. diocese that crosses state lines between New Mexico and Arizona. The students sat in rapt attention during the Mass, singing the songs and participating in prayers. After Mass, they listened intently as the governors of the Acoma and Laguna tribes offered words of wisdom and participated in a special candle blessing ceremony. Inside the classrooms — where multiple grade levels are taught by a single teacher — students of all ages are excited to show off their latest projects, with one first-grader excitedly pointing out a green bud barely visible in the soil of the potted plant he has been tending for science class. 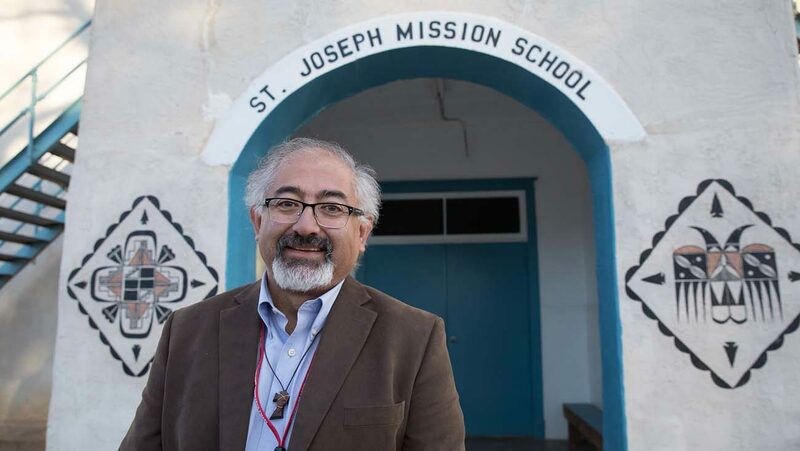 Trujillo described the school’s growth and success with a similarly botanic metaphor, comparing the plight of a mission diocese like Gallup to the challenges of living in a desert. By all accounts, the school’s efforts are bearing incredible fruit. Eighty percent of St. Joseph’s students graduate, go to high school and finish college. They have gone on to jobs in business, health care, tribal leadership and the state Legislature. One of them even came back to teach at St. Joseph. These success stories are emblematic of the school’s goal to empower students with a feeling of self-worth that is rooted in the Catholic faith, Trujillo said.